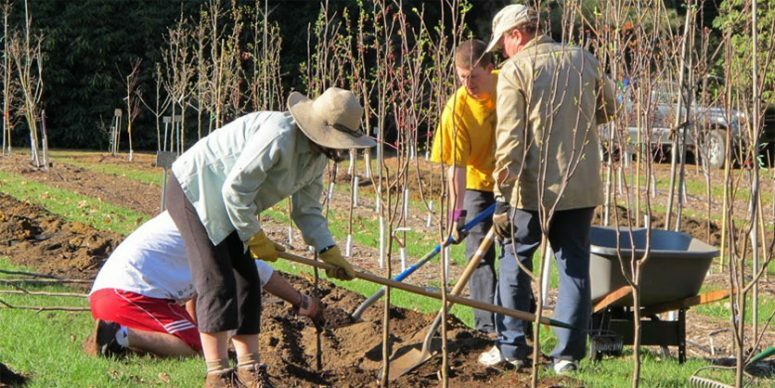 We are a group of volunteers who help plant and care for the trees of Burlington. Our goal is to promote a vision of a city graced by a variety of beautiful and healthy trees, and a citizenry actively involved with the perpetual expansion and preservation of our urban forest. Branch Out Burlington! was formed in 1996 and became very active in 1998 after the catastrophic ice storm that extensively damaged and necessitated the removal of so many of Burlington’s trees. Branch Out Burlington!, known as BOB!, assisted the city with educational forums and replanting efforts. BOB! then established a tree nursery, enabling us to grow trees, at a reduced cost, to be planted in the greenbelts and parks of Burlington. BOB! sponsors an annual tree walk in a different area in Burlington each year, and holds an Awesome Tree contest, to encourage the community to look up and notice the trees in the neighborhoods – many quite beautiful, some truly awesome. BOB! also hosts a yearly winter workshop with an expert guest speaker on different topics each year. An annual BOB! Tree Sale has bare-root, ready-to-plant trees at especially affordable prices. The BOB! Tree Keepers program encourages citizens to take care of the trees on their street, or in their greenbelt; to join, or at least get in touch with Branch Out Burlington! if they need advice, and to let the city’s urban forester, Warren Spinner know when there is a problem that needs professional help. Trees perform so many environmental services for our city – cleaner air, stormwater amelioration, better temperatures, and not least their psychological benefit to their human neighbors. Help keep Burlington green! This entry was posted in Events in the Broader Community and tagged Burlington, climate, community, education, Environment, Vermont. sustainability on February 12, 2019 by S.C. Intern.